His Connection with the Spalding Manuscript and Book of Mormon. Other engagements prevented my hearing President Fairchild’s lecture last evening upon the Book of Mormon and its relation to the Spalding manuscript. It has been the popular belief among the older citizens of the Reserve, and especially among those who had [personal] observations and contact with early Mormonism, that the Book of Mormon was compiled or rewritten or at least made up in part from the Spaulding document, and yet there was no direct or positive evidence to prove it. From some facts and incidents connected with the career of Joseph Smith and Sidney Rigdon when they were in Geauga and Portage counties preaching their alleged new gospel, I came to the conclusion some years ago that the Book of Mormon was the work of Sidney Rigdon, with perhaps some changes or additions by Smith or others. So far as I know these facts and circumstances have never been published. The truth or falsity of the Spalding matter in no way affects them, and they came to me in a way that leaves no doubt on my mind that the Book of Mormon, or a large part thereof, was written by Rigdon within two miles of the spot where I am now writing. George Wilber, one of the early pioneers of Geauga County, taught school in the winter following the alliance of Smith and Rigdon, in a log school-house a mile south of the centre of Bainbridge. Rigdon lived in a log house about 200 yards from the school-house, and young Wilber, who has heard Rigdon preach before his alliance with Smith, often called on him during the noon hour of recess and sometimes in the evening. Rigdon had acquired the reputation of being something of a biblical scholar among the pioneers, and was always a very persuasive and eloquent preacher. Some of the keen-sighted people, however, had lost confidence in him. They discovered that he had a strong religious ambition that was not tempered by Christian grace and humility. For a year or more before the advent of Smith they saw that Rigdon was bent on devising some new dogma: in short, to start a new church or sect that he could call his own or whose leadership he could share with only a few. It may be proper to state that George Wilber was at that time a young man of high character and good education, and for more than forty years no one in Geauga or Portage had a better reputation for truth and moderation. He was the father of Prof. C. D. Wilber now of Nebraska, who was a room-mate of Gen. Garfield at Williams College. He died about four years ago at Aurora, Ill. Wilber’s statement, moreover, of the work and conduct of Rigdon that winter was corroborated by some of the neighbors in the school district. 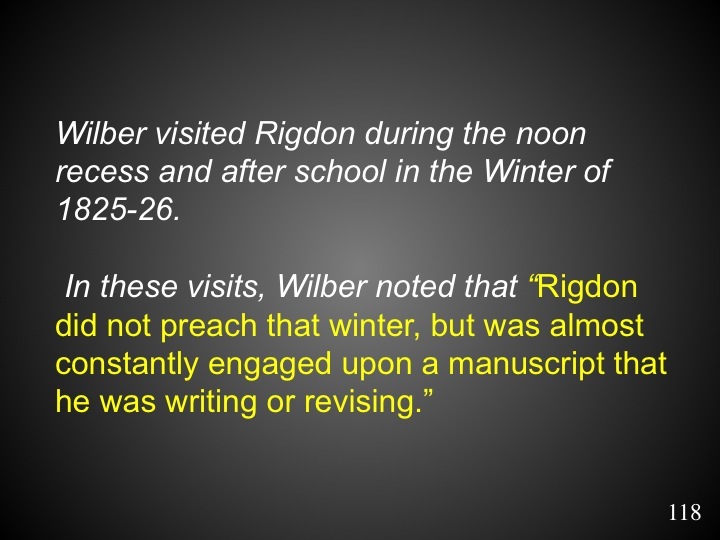 Rigdon did not preach that winter, but was almost constantly engaged upon a manuscript that he was writing or revising. Wilber noticed that towards the close of the term there was much more of it than there was the first time he saw it. Rigdon had before that time been free and communicative, especially upon religious topics; he now appeared reserved reserved and at times reticent. Whenever any reference about his manuscript he seemed disposed to parry inquiry by some general explanation that he was making notes or preparing some papers to throw light upon some portions of the gospel. The following spring Smith appeared and he and Rigdon went off together and were gone some months. It was reported that they had gone to Pittsburg, but whether true or not no one could say. It was generally believed, however, that Smith at least visited Western New York before either returned to Ohio. Soon after their return the Book of Mormon was announced. Smith was mysterious and silent, assuming familiarity with the supernatural. It was difficult to measure or discover his powers or qualities, because of his silence and professions as a prophet. Those who were not awed by the glamour of mystery became convinced of one thing — that he was a man of little or no education, while Rigdon was a fine orator, a fair writer, and among the men of that day a good scholar. Rigdon believed that his own attainments would put him at the head of the new church. It did not take long, however, to see that he had failed to measure properly those masterly powers of his companion in acting the part of the prophet. In a few months he saw that he must take a subordinate part, and from that time onward his zeal flagged. He drifted along, though still a leader, until the death of Smith, when he found that Brigham Young, a natural leader of the class of men who composed their followers, held the reins of power with a strong hand. Rigdon became disgusted and disheartened. He soon left them forever, and died some years ago in Pennsylvania. Ten years ago this winter I spent two weeks in Salt Lake City. Elder Orson Pratt had been for many years the historian [sic – theologian?] of the Mormon Church. As my father had been acquainted with him in his younger days, I called upon him and made myself known. He was then an old man of about 80 years. During our conversation I inquired of him why it was that his people crossed what was called the Great Desert and settled at Salt Lake. He replied that they had Fremont’s narrative, and that he carried a copy during their journey over the plains and mountains. In the history of the Mormon Church it is stated that Pratt was with the advance guard, and on their arrival at Salt Lake Pratt made observations, and found the latitude and longitude. Soon after the interview I examined a copy of Fremont’s narrative, and found the latitude and longitude given. Now, Pratt was not scholar enough to take an observation of that kind, so he must have announced their locality from the information given by Fremont. It is due to Elder Pratt to say that I do not believe he wrote this statement. He was more of a custodian of Mormon records than a historian, and probably permitted the statement to be made. The Book of Mormon contains many internal evidences that Sidney Rigdon was the author of at least a good portion of it. How many others had a hand in it, or what other manuscripts, if any, assisted in the work, it would be difficult now to determine. C. E. HENRY. GEAUGA LAKE, O., March 9.